Best energy efficient replacement windows? The material used to construct the frame will have a sizable impact on window efficiency. So if you are looking for the best energy efficient replacement windows, understanding the differences between the materials most often used will only make purchasing them much easier. Depending on the particular unit, the frame can be responsible for 10% to 30% of the total insulation. Some materials commonly used to construct frames insulate better than others. The frame will have a big impact on overall window energy efficiency. Aluminum frames are very light and durable. Aluminum (especially if anodized) is virtually maintenance free. However these frames are poor insulators because they absorb and transfer both outside heat and cold. Aluminum fames in cold temperatures can also cause condensation, which can result in moisture buildup within the window surface. Since the entire frame is made up of aluminum as well, they are equally as light and durable as traditional aluminum frames. But the frame is split into interior and exterior components, resulting in considerably less absorption of heat and cold, improving window efficiency. The thermal break also reduces built up condensation. Wood frames are popular primarily for cosmetic reasons. But from a window efficiency stand point wood insulates quite well. 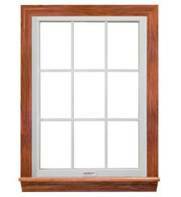 Wooden frames increase window energy efficiency (by reducing solar heat gain) more effectively than aluminum. Wood does require a fair share of maintenance. But if maintained well, wood can be very durable. Essentially a double sided frame using wood for one side, and a different material for the other. Aluminum or vinyl is usually the other material used. Improvement in window energy efficiency is not the reason for using two different materials. Less maintenance and lower initial cost is the objective. The maintenance free aluminum or vinyl is used to weather the outside conditions, while the attractive wood is retained for the inside. Vinyl is a very durable multipurpose plastic. These frames require no painting or maintenance. Vinyl frames are also very good at insulating heat and resisting moisture. They are more or less equal to wood frames from a window efficiency standpoint. More recently insulated vinyl frames have been introduced that contain other materials within the frame to provide further insulation and even less condensation. Composite frames are essentially made up of different compressed wood particles. Hybrid frames consist of two or more materials, these materials are used throughout the entire window frame. Composite and hybrid window frames are slightly more durable and more energy efficient than wood and wood clad frames. Fiberglass frames are as maintenance free as vinyl frames. But fiberglass is considerably stronger, making these frames considerably more durable. Fiberglass can also be shaped and sculpted easier than vinyl. From a window energy efficiency standpoint, fiberglass frames are superior to wood, composite, vinyl and most hybrid frames. Looking for the best replacement windows? Take your regional climate into consideration first. both heat loss and heat gain. Low e glazing, or low emittance coating, is a microscopic coating that is pre placed on the multiple layers of glass, providing even further insulation. Gas Filled Windows have non toxic gases in the air spaces between the glass layers to even further improve energy efficiency. New Home Windows come in operating styles. A double hung window and a sliding window can have a different effect on your heating and cooling bills.